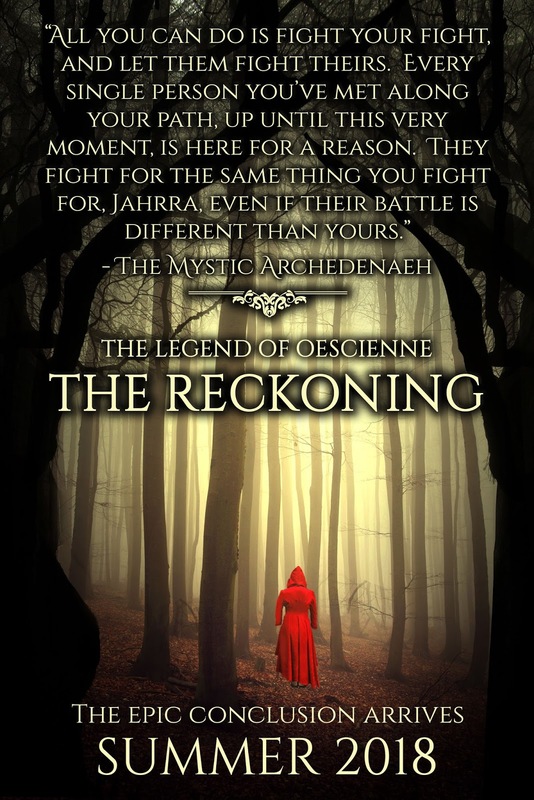 NEW Legend of Oescienne - The Reckoning Snippet! Howdy eager readers! I know many of you have been waiting patiently for the release of the fifth and final book in the Legend of Oescienne series. I have a date in mind, but I'm still keeping hush-hush about it until I get all my files back from my fabulous Beta Readers and my marvelous editor. Once I get a chance to look at their suggestions, I might be able to lock in on that release date with more confidence. Until then, I have another snippet for you! Now, if you are signed up for my newsletter, then you should have received this sneak peek last week, but in case you missed it, here you go! This is a scene featuring dialogue between our two main characters, Jaax and Jahrra, and I feel it sets the tone for a good portion of the book. Enjoy and feel free to leave a comment telling me what you think! As the evening stretched on, and as the elves began weaving their tales, Jahrra found their camaraderie did nothing to take the edge off her own restlessness. After only two stories were shared, she stood up and moved to stand casually near the edge of the great circle of light cast by the bonfire. When the third storyteller reached the exciting part of his tale, she slipped deeper into the darkness and headed toward the river’s edge. A large rock ledge stretched out from the tall bank of the Hrwyndess and hung over the rushing water some thirty feet below. She stepped out onto the slab of stone and turned her face upward. Closing her eyes, Jahrra breathed in the rich, cool air and let the light of the silvery moon bathe her face. What she wouldn’t give to take all her racing thoughts and shove them into a box where they couldn’t escape, if only for a few minutes. A soft rustle broke into Jahrra’s moment of solitude, but she did not jump. Instinct, or maybe just years of experience, told her who approached. “You are missing some very good stories,” Jaax drawled from behind her. Jahrra turned and gave him a half smile, not putting much effort into it. So much for avoiding her friends for the rest of the night. The fire some fifty yards away had grown larger, she noticed, taller than the dragon cast in shadow standing so close by. Ale and more food was being passed around as well, and where she had left Dervit, some of the younger Hrunahn warriors had moved in. From what she could tell, it was the limbit who was weaving the tales at this point, not the elves. The upward curve to the corner of her mouth was more genuine this time, though her moment of joy did not last. Jahrra turned back to face the rushing river below, not in the mood to take part in the merriment. “I’ve heard all of Dervit’s tall tales before,” she replied. If the Tanaan dragon had hoped to cheer her up with his light tone, he was mistaken. Jahrra continued to stand there on the ledge of granite, arms crossed, the heel of one boot propped up against a small boulder. He knew when to leave her alone, and when she needed someone’s quiet presence. In this case, it was the latter, though Jaax wasn’t too keen on remaining silent and Jahrra would never admit she needed him. Jahrra shook her head, the river below mimicking her current mood. Now he wanted to talk? Despite her obvious desire to be left alone, Jaax wasn’t about to give up so easily. All he got in return was a derisive snort. As if she didn’t already know all of this. When he drew breath to speak again, Jahrra turned to look at him, the barest hint of desperation and fear dominating her expression. The dragon went utterly still, his eyes holding hers. He would not look away, not until she spoke her mind. She needed to say whatever it was that bothered her, but whatever it was needed to be removed the way a thorn must be drawn from the skin. There, she’d said it. It hadn’t been about Ellyesce’s secrets earlier, and it hadn’t been about Jaax’s continued insistence on keeping her in the dark. Those had only been catalysts to her fear; excuses for her to purge her soul of the dark emotions lingering there. Only, her argument with Jaax and Ellyesce hadn’t assuaged her restlessness. Not at all. Jahrra whipped her head back around, then bent to pick up a stone. She drew her arm back and launched it into the turbulent water below. Jaax hummed low in his throat, but said nothing. Jahrra sighed, then fell into a crouch, arms wrapped around her knees. She wanted so badly to cry, to purge herself of the fear, pain, and anxiety, but she fought against that weakness. Her next words were so quiet, Jaax would have missed them over the rush of the river and the boisterous laughter of their elvin friends had he not possessed the sharper senses of a dragon. “I don’t want to die,” she murmured. Fear and fury and wrath wrapped their steely bands around Jaax’s heart at the tone in her voice. When he was near enough for Jahrra to reach out and touch his shoulder, Jaax settled down upon the ground, his clawed fingers curling around the edge of the steep riverbank. The moonlight shone down through the gap in the trees, staining the world in shades of cool white and shadow. She turned her head, blond hair slipping from her shoulder, the pale moonlight above turning her eyes to silver. As the revelry carried on behind them, Jaax and Jahrra sat in companionable silence, each lost in their own thoughts as the peace of the night wrapped around them, sealing their words together like an ancient vow neither time nor distance could ever break.